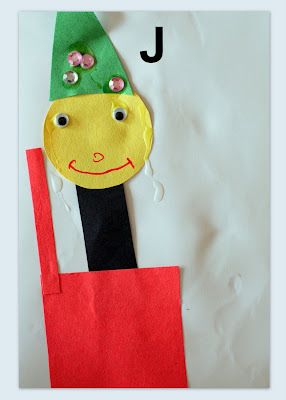 This week I'll be sharing about our preschool fun studying the letter "J" and at the end of the post you will find Mr. Linky so that you can participate too in the fun by sharing what you've been doing during your preschool time. The alphabet book page for the letter "J" was a Jack in the Box. The shapes for the page were really simple - a circle, a small rectangle (box lid), a square, a triangle, and a rectangle for his "neck". This jellyfish looks so cool when it is hanging up in a window and the light shines through it! Cut a circle out of the contact paper (as large as you would like - remember you are folding it in half). I traced a bread plate for the outline. Spread glitter glue over half (or all!!) of the contact paper. Fold the circle in half and seal it shut. 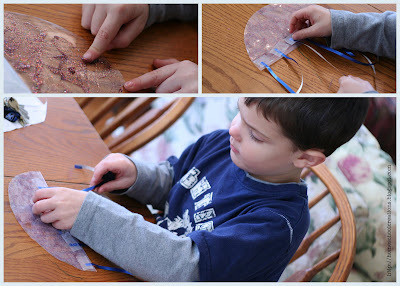 Use scotch tape and thin wrapping paper ribbon to make legs/arms for you jellyfish. Jack Be Nimble - Make a candlestick out of a toilet paper roll and have fun jumping over it! Jump rope - Zachary isn't too great at this one, but we had fun trying! We used jelly beans this week to do a few different activities. We guessed how many were in a jar and then actually counted them together. We sorted them by color and had fun sampling them and trying to guess what the flavor of the jelly beans were (Jelly Bellys ROCK!! - but poporn flavored jelly beans are still yucky to me). John 14:6 - "Jesus said, I am the Way, the Truth, and the Life." We've been using the book My ABC Bible Verses by Susan Hunt. It has a quick little devotional and a few questions at the end of the story along with review from previous weeks. This week we used our Handwriting Without Tears worksheet to practice our letter "J" (the link will take you to the Scribd site where I uploaded the one I made). The Preschool Corner is a place for us to share the ideas we are using during our "preschool time" with our kiddos. You can join in the fun and record what you are doing in your house. Publish a post on your blog and link directly here. Then be sure to link to the blog carnival on this post so other bloggers can stop by to visit you. Your work is incredible! Please do not give up on this idea! I plan to join in soon...and bring my friends along, too! I am trying to teach my son the alphabet J and lack of idea for the craft. The jelly fish one is cool.. Thanks for sharing. We're on the letter J next. I love the jelly bean and jelly fish ideas! 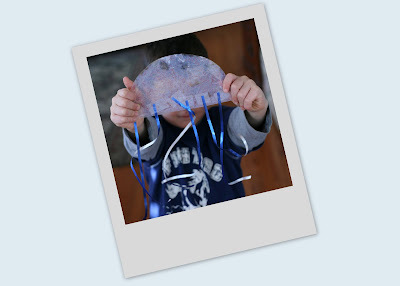 I absolutely love this jellyfish craft!!!!! Great idea!